Bernie Rocks Buffalo. He Also Did Something Else. Sanders turned out a huge crowd. He also took a notable detour. Buffalo—Before Bernie Sanders spoke to over 11,000 people on Monday at the University of Buffalo, he made a brief unscheduled stop. The crowd in the alumni arena was more diverse than most Sanders rallies—not as diverse as Buffalo itself, a city where non-Hispanic whites are in the minority, but with a greater number of black and brown faces than I’d seen in other rallies in other parts of the country. And like every Sanders rally I’ve been to, the crowd was happy to be there, shouting “Ber-nie! Ber-nie!” at every rumor of the candidate’s appearance, and gleefully taking selfies of one another before, during, and after Sanders’s 90 minute speech. The audience at Sanders’s first stop was a lot quieter, a lot older, a lot whiter—and a whole lot smaller. They were pleased to see Sanders, but there was no mistaking the scene at Local 1122 of the Communications Workers of America for a rock concert or a sporting event. These were 25 shop stewards at Verizon who had to prepare their members to go on strike on Wednesday morning, and the mood in the room was a mixture of anxiety and defiant anger. When Sanders arrived, the stewards, who had been discussing the likelihood that Verizon would try to discipline or discharge members, interrupted their strategy session to listen to the man Larry Cohen, the former president of the union who now leads Labor for Bernie, told them had always had their backs. “I want to thank you for standing up to the outrageous greed of corporate America,” Sanders told them, pointing out that Verizon had booked $ 39 Billion in profits over the past three years. The company recently bid billions for the loss-making Yahoo—yet continues to demand its workers pay more for their health coverage. 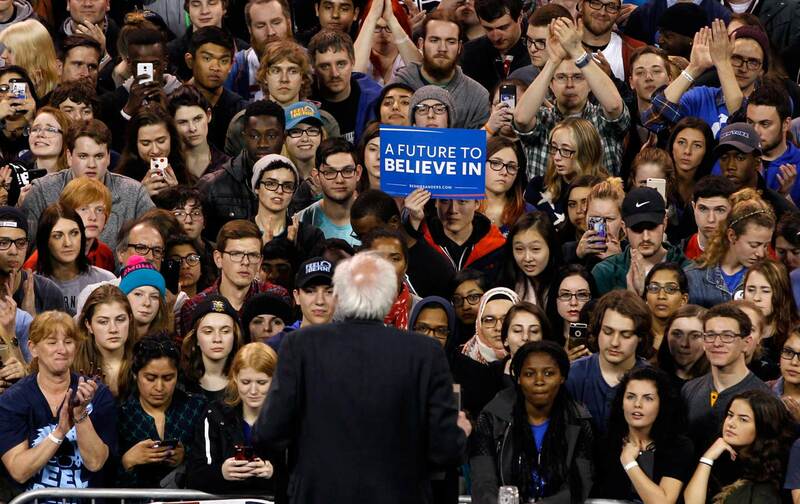 On paper, Buffalo doesn’t look like Sanders country. Two years ago, when Zephyr Teachout’s underfunded campaign gave Andrew Cuomo a bloody nose in the Democratic gubernatorial primary, Cuomo carried Erie County by a 52 percent margin. In a city that has been losing population since before World War Two the Democratic Party—and the patronage it can wield in government—has long been the area’s only lifeline. The African-American vote is a big part of that—which is why Byron Brown, who became Buffalo’s first black mayor in 2005, is still in office. A candidate fixated on the White House doesn’t keep 11,000 people waiting so he can cheer up a couple of dozen shop stewards nervous before a big strike. But Bernie Sanders did. Because for him, too, this has never been just about winning the nomination—or the presidency.